SPX Form No. 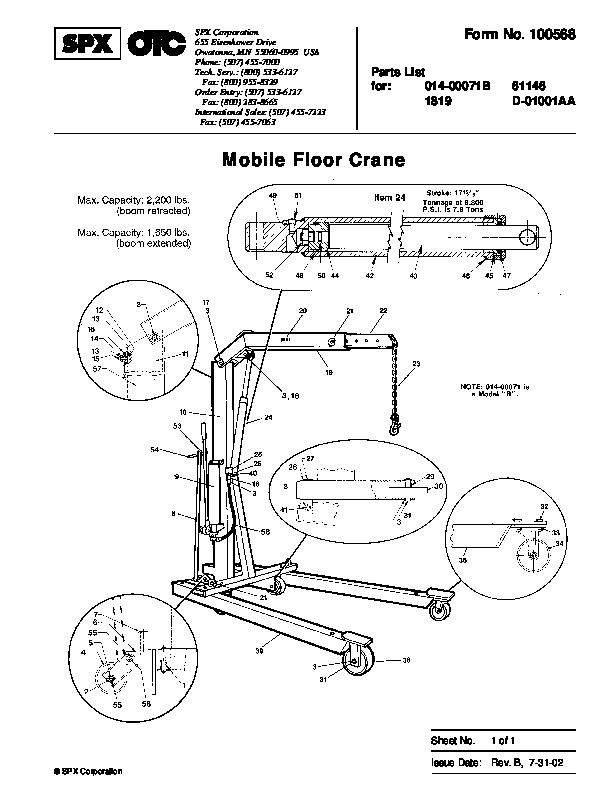 100568 Parts List for: 014-00071B 1819 61146 D-01001AA Mobile Floor Crane Sheet No. SPX Corporation 1 of 1 Issue Date: Rev. 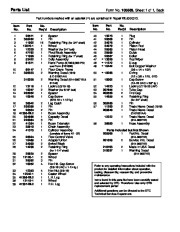 B, 7-31-02 Parts List Form No. 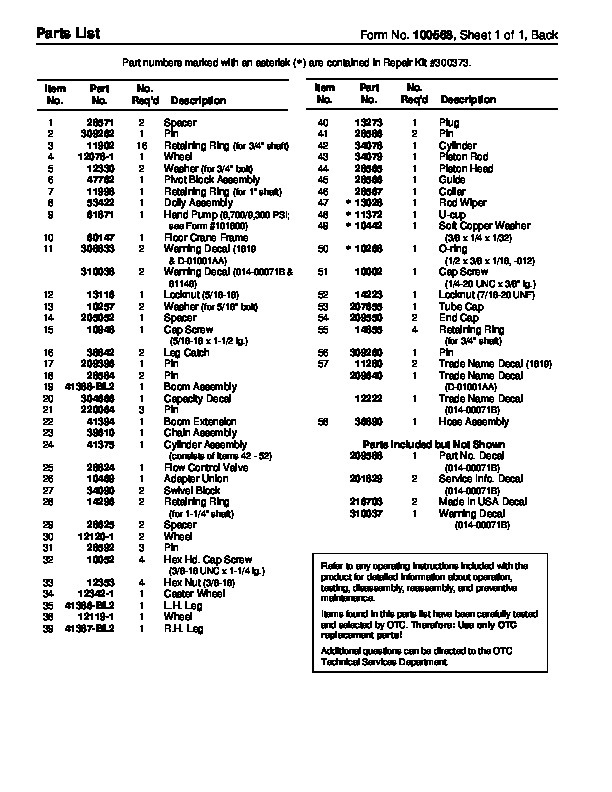 100568, Sheet 1 of 1, Back Part numbers marked with an asterisk () are contained in Repair Kit #300373. Item No. 11 Part No. 28571 309262 11902 12078-1 12330 47762 11998 53422 61871 60147 308833 310038 No. 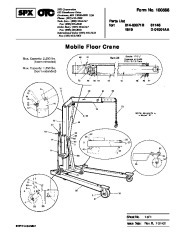 Req’d 2 1 16 1 2 1 Description Spacer Pin Retaining Ring (for 3/4 ” shaft) Wheel Washer (for 3/4 ” bolt) Pivot Block Assembly Retaining Ring (for 1 ” shaft) Dolly Assembly Hand Pump (8,700/9,300 PSI; see Form #101800) Item No. 40 41 42 43 44 45 46 47 48 49 50 51 52 53 54 55 56 57 Part No. 13273 28586 34078 34079 28565 28566 28567 13028 11372 10442 No. Req’d 1 2 2 4 1 2 Description Plug Pin Cylinder Piston Rod Piston Head Guide Collar Rod Wiper U-cup Soft Copper Washer (3/8 x 1/4 x 1/32) Floor Crane Frame Warning Decal (1819 & D-01001AA) 10268 10002 14223 207655 209550 14855 309260 11280 209640 12222 O-ring (1/2 x 3/8 x 1/16, -012) Warning Decal (014-00071B & 61146) Cap Screw (1/4-20 UNC x 3/8 ” lg.) 12 13 14 15 16 17 18 19 20 21 22 23 BL2 Locknut (5/16-18) Washer (for 5/16 ” bolt) Spacer Cap Screw (5/16-18 x 1-1/2 lg.) Locknut (7/16-20 UNF) Tube Cap End Cap Retaining Ring (for 3/4 ” shaft) Leg Catch Pin Pin Boom Assembly Capacity Decal Pin Boom Extension Chain Assembly Cylinder Assembly (consists of items 42 – 52) Pin Trade Name Decal (1819) Trade Name Decal (D-01001AA) Trade Name Decal (014-00071B) 58 36890 Hose Assembly Parts Included but Not Shown 209588 1 Part No. Decal (014-00071B) Flow Control Valve Adapter Union Swivel Block Retaining Ring (for 1-1/4 ” shaft) 201829 216703 310037 2 2 1 Service Info. Decal (014-00071B) Made In USA Decal Warning Decal (014-00071B) Spacer Wheel Pin Hex Hd. Cap Screw (3/8-16 UNC x 1-1/4 lg.) Hex Nut (3/8-16) Caster Wheel L.H. Leg Wheel R.H. Leg Refer to any operating instructions included with the product for detailed information about operation, testing, disassembly, reassembly, and preventive maintenance. Items found in this parts list have been carefully tested and selected by OTC. Therefore: Use only OTC replacement parts! Additional questions can be directed to the OTC Technical Services Department.